Speakers at a concluding session of a training workshop on migration underscored the need for greater liberalisation of international labour market to ensure an equitable and fair global system. They stated that resistance to sound and just policies on migration has created conditions that have encouraged clandestine movement. This, in turn, has resulted in migrant workers getting employed in unprotected sectors of the economy, living in poverty in crime-ridden ghettos, ostracised by the rest of the society and thereby making social integration more difficult. 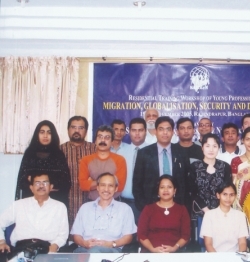 The ceremony was organised by the Refugee and Migratory Movements Research Unit that hosts the South Asian Migration Resource Network (SAMReN) to mark the conclusion of a residential training workshop on Migration, Globalisation, Security and Development held at Rajendrapur from 19-28 November 2005. Twenty two professionals, including university teachers, researchers, officials of government, international organizations and NGOs, representing receiving and sending countries participated in the workshop. The faculty was constituted of experts from South Asian countries and also from UK, Ireland, Philippines, Ghana, Albania, Hong Kong and Switzerland. In his valedictory speech Manolo Abella, former head of migration of International Labour Office, stated that in this fast globalising world the international community has to re-think the way its looks at migration. Recent studies of ILO noted that globalisation has so far led to divergence, rather than to convergence of incomes between developing and developed countries. He argued that “intuitively moving workers has a potentially bigger impact on increasing productivity than moving goods across borders because wage differentials are enormously much larger than differential in the price of goods”. Dr. Abella quoted figures that suggest that the “world would be $150 billion richer if only countries were to liberalise the temporary movements of migrant labour the equivalent of only 3 percent of their work force”. In presenting the summary and conclusions of the workshop Dr. Tasneem Siddiqui of Dhaka University highlighted the need for a better understanding of the complexity of voluntary international migration in a rapidly globalising world. She stressed the need for increased appreciation of the contribution of migrants in global social, economic and cultural development and in reducing poverty. The participants noted that events in the past few years had led to increased securitisation of migration that in reality has contributed to enhanced insecurity of migrants without achieving its goal. In this context, the workshop underscored that migration should not be securitised and that challenges faced should be dealt within the bounds of regular political, legal and administrative structures of the states concerned. The workshop also recommended increased dialogue between receiving and sending countries, realistic assessment of labour needs and promotion of multiculturalism in receiving countries, promotion of pre-departure orientation training and information campaign on safe migration in sending countries, and adoption of gender sensitive migration policies. Prof. SMA Faiz, Vice Chancellor of the University of Dhaka, presided over the concluding ceremony. Among others, Dr. Justice Syed Refaat Ahmed, Prof. M. Asaduzzaman, Chairman of the University Grants Commission, Touhid Hossain, Additional Foreign Secretary, Stephen Bridges, the Deputy High Commissioner of the UK, eminent littérateur Dr. Ashraf Siddiqui and advisor to the leader of the opposition Dr. M. A Samad attended the ceremony which was rounded off with a dance performance of Nrittanchol directed by Shamim Ara Nipa and Shibli Mohammad. The author is a Professor in International Relations, University of Dhaka.